You are currently browsing the category archive for the ‘Risen Drums’ category. I think originally the idea was that the video lessons I did for Risen Drums would be my part in a SERIES of video lessons taught by lots of different RD guys. So far only mine exist. Ha. We’ll see if anything surfaces in the future. Gotta love that orange acrylic kit though. Whew. The time has come for me to part with the amazing amber acrylic kit. I lovelovelove these drums, but we hatched a plan for an incredible new RD kit for my arsenal, and I don’t want to be a drum hog. This kit began as a custom drumset specifically for the Bill Mike Band. I also used them for all the video lessons, in quite a few sessions, and live with BMB for a few years now. Last year I added some additional toms to the kit, and the sizes are unlike anything I’ve ever seen. 14×24 kick, 11×15 rack, 16×18 floor, and 16×20 floor. The 9×14 snare will be sold separately. Seriously, this kit is crazy awesome. I hate to part with it, but such is life. I spent the morning at the RD shop today, because my new kit arrived. My deal with Risen is such that I basically get a new kit every month or so, because Keith (owner) lets me use whatever drums he has laying around on a given week. The orange acrylic kit is mine to keep, but the rest of the “normal” kits you might see me playing are always rotating. BUT… today… I got another kit that will be mine to keep. These drums were previously owned by Jeremy (Bwack) from the David Crowder Band, and they’ve been all over the world in addition to being on every Crowder record so far. The guys at the Risen Drums shop are now on Twitter. The account was born earlier today, and this video was “tweet” number two. If you’re a Twitter user like I am, you’ll want to follow the RD page… asap. This dude was John Bonham’s drum tech during the major stage of Zeppelin’s career. He’s *maybe* a little bit of a dork, but the video is cool. I came across it earlier this week while geeking-out about my recently-expanded Bill Mike kit. The amber Vistalites sitting in the background on this vid is the kit that inspired the one I have now. I believe Bonham used those drums during Zep’s 1977 tour following the release of The Song Remains The Same. Quick story about Ochletree’s dork factor and Bonham’s original amber Vistalites: Joel Hanson, a singer/songwriter that I play with, was in a Grammy-winning band in the 90’s called PFR. For one of their records, producer Jimmie Lee Sloas called Ochletree and had him fly out to Minneapolis with Bonham’s actual amber Vistas so the band could use the drums on the album. Ochletree set the kit up, which apparently included two hours of sitting on the ground cross-legged, methodically shredding a stack of newspapers into small strips, and filling the kick drum with them. This, according to Ochletree, was how Bonham got his famous kick sound. I’ve been at Matt Patrick’s new studio all afternoon today. He owned/operated Two Pillars and recently changed locations, now working out of a super cool space he calls “The Library.” It’s a great vibe and a really easy set-up. We did a hip-hop single today, but I’ll be in here doing a full-length folk/americana record in a few months. I’m really looking forward to spending an entire week in this place. 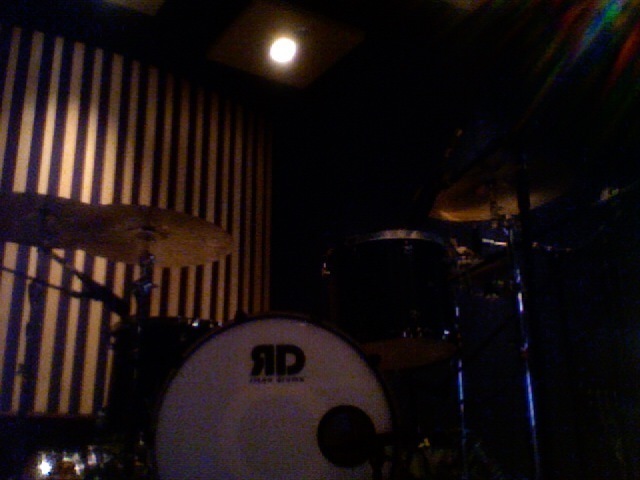 Yesterday I spent some time tracking a single for my friend Ryan Plewacki, of Ryan Paul and the Ardent. We did the tune at a cool studio just outside of downtown Minneapolis called Urban Hub. The studio is part of a youth ministry in Minneapolis known as Urban Ventures. David, the head engineer, is able to offer free studio time to some of the troubled youth in that area in an effort to get them off the street and provide something for them to put their time and creative energies into. The set-up at Urban Hub is top notch, and Risen Drums even donated a beautiful midnight blue satin kit (which meant I didn’t have to haul in my own drums for the session)!